As we head to this year's BlogPaws pet blogger conference in Salt Lake City, Cosmo and I once again have the honor of participating in the Pedigree Write a Post, Help a Dog campaign! Now in it's third year, the program has generated 650 blog posts and 6.5 TONS of food to help feed shelter dogs! Here's how you can help too! 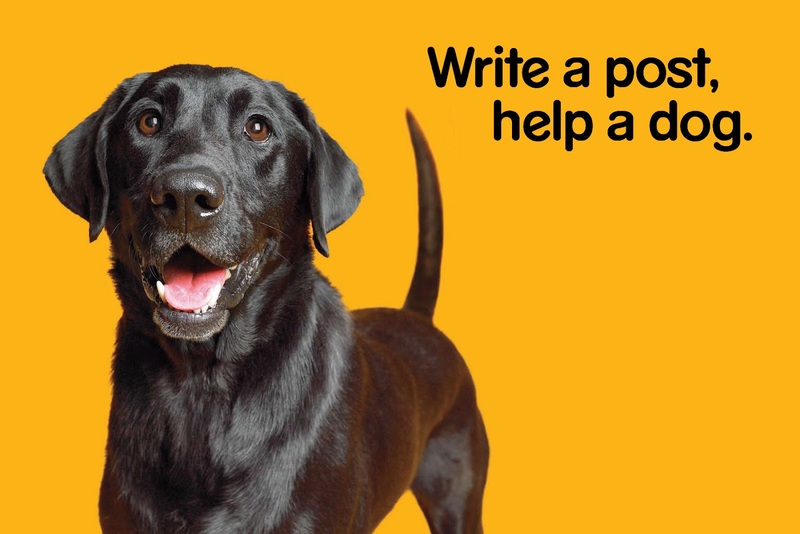 Simply write a blog post from now until midnight on Saturday, June 30 and mention Pedigree's commitment to adoption and finding shelter dogs loving homes. For each post, Pedigree will donate a 17-pound bag of Pedigree Dry Dog Food to a shelter in need. You can use any of the wording or images you find in this blog post. Or perhaps get some inspiration from the Pedigree Adoption website. It's up to you! Just write a post and a shelter dog wins. Once you write your post, add it to our Blog Hop below, so we can see the collective effort for helping feed more shelter dogs! And remember, any type of blog can post to help a shelter dog, so please spread the word! 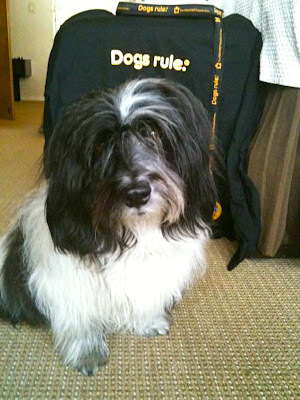 Update: Once you post, enter our Rafflecopter giveaway for some fab Dogs Rule swag! At BlogPaws, along with eight other Pedigree-sponsored bloggers, we'll be handing out postcards like the yellow images you see above. We hope that everyone will write a post and spread the word so we can reach our goal of 450 posts for a total donation of 7,650 pounds of food! The sooner you post, the more people will see it! So go ahead and Write a Post and Help a Dog! You know you want to! Cosmo wants you to write a post too! This photo was taken after he worked his paws off at BlogPaws West in Denver 2010, the first year of the Pedigree Write a Post, Help a Dog campaign. Cosmo reminds you that you can use any of the info in this post, including his photo if you want to! And here's a badge image you can use too! Feel free to use it in your post or on your sidebar! We linked the badge on our sidebar to http://www.pedigreefoundation.org/. 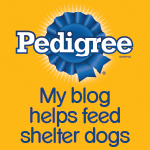 And now, to officially introduce the Pedigree-sponsored bloggers! Disclosure: We are sponsored by Pedigree at BlogPaws; we are not compensated any other way for our posts. Great post, I am in such EXCELLENT company! So pleased and grateful to be a part of making this happen ... go TEAM PEDIGREE!!! where do I write the post? The program calls for a blog post to be written, but we appreciate your support of shelter dogs no matter where you post it! Pedigree Rules!I love Pedigree's commitment to adoption and finding shelter dogs loving homes. Wow! You and your mum are doing amazing things. Hope to stop by on August 7! Thank you Pedigree for helping these animals! Even though I am a cat blogger, I LOVE THIS CAMPAIGN and will be posting on Saturday morning!! 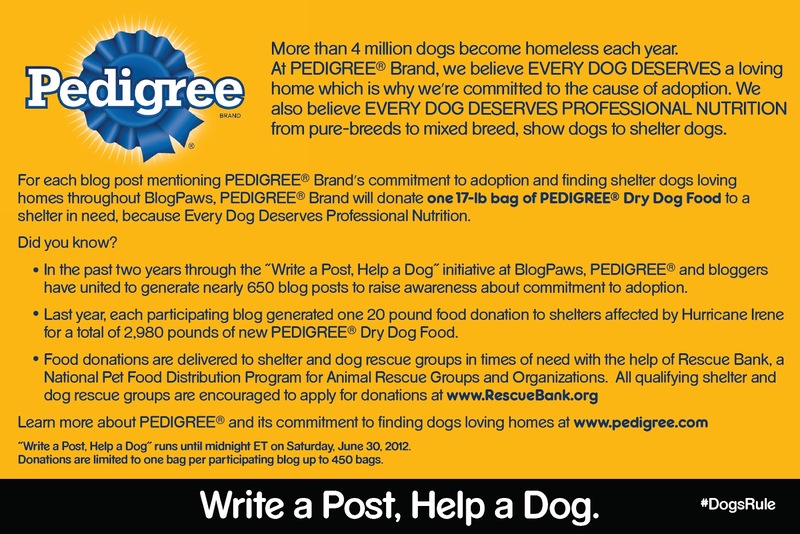 I think it is so great that Pedigree is sponsoring this wonderful effort to feed shelter dogs! I also shared your post on facebook to generate more interest! !